postedelsewhere, originally uploaded by mathowie. 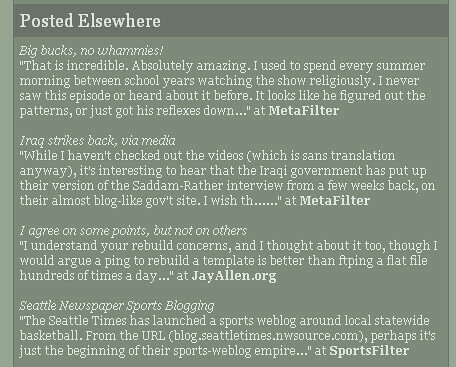 Nearly six years ago, I cobbled together a trackback script to make a mini-blog of everywhere I’ve commented on the web, accessible on my personal site. It was a pain to use and not automatic enough, but I’m still surprised that this problem hasn’t been solved in all this time. If a standard hasn’t emerged by 2015, let’s start taking hostages.